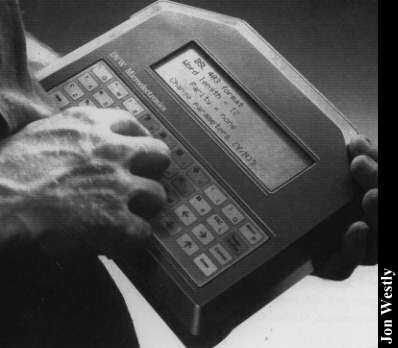 In 1980 we designed a computer called the Husky. It was first manufactured in around April(?) 1981 and measured 9 1/2" x 8" x2"(24cm x 19.5cm x 4cm) max. It weighed 2 Kgm with batteries. I would like to think that it constituted a number of firsts - but this will depend on definitions. The first laptop computer ..... (Byte described it as a 'lapheld' in 82 I think - but the expression laptop had not been created.) The issue here is whether a Laptop has to be a clamshell. Husky have never made a clamshell because we make rugged computers (see below) - and hinges create weakness. Notebooks clearly implicate a hinge. My thesis, baldly stated, is that in 81 something happened that created a two tier history of computing. IBM effectively took computers to the mass indoors market (the rest is history). Husky, in distinction, took computers to the outdoor market - their being waterproof against accidental immersion and rugged - the original Husky could be safely driven over, ensured their take-up by e.g. the military and the water utilities. In niche markets Husky is as well known as IBM (geo-technical rugged field service, emergency services), but the general consumer is likely to be unaware. The result is that Husky is absent from the pages of computer history - part of a lost or secret history. I would like to change that! Click here to view all comments for the Husky Husky and to leave your own. Click here to view comments about other Husky computers.